If a writer sends a message in the new media galaxy, can it be heard? It’s not as if (like the tree in the proverbial forest) there isn’t anyone listening. It’s a highly populated and active space. It’s a space that readers frequent and a space where they spend money. It’s a space, it seems, with a lot of potential for writers. 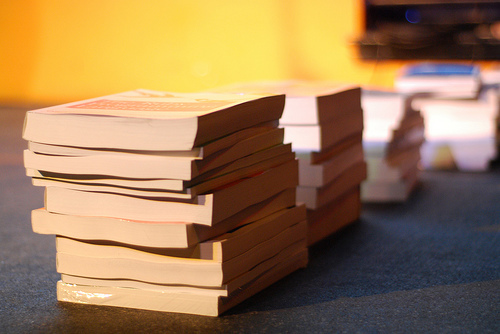 Indeed, self-publishing e-books has proven a boon for many. Stories abound of humble scribes who upload a file and soon find themselves climbing the best-seller lists and being celebrated in front of packed houses or better yet, being signed by traditional publishers (as happened recently to Darrell Pitt). Previous successes in self-publishing such as Marcel Proust and Matthew Reilly are also noted (despite the fact that they self-published to print). With these inspiring stories, the low cost of access (and the high profits on royalties) it’s no wonder that many writers are launching their work online. Bundling e-books with those of established writers is an effective way to bring readers to new and emerging writers says O'Brien. Thanks to Rachel Ford James for use of this image Stacks of Free O'Reilly Books at Ignite Boston 5 under Creative Commons. Connor Tomas O’Brien (writer and co-founder of Tomely, a DRM free e-bookstore) says that unlike other forms of online publishing, the e-book brings a little more to writers. ‘The book has historically been purchased with real currency – so when you transfer that to the electronic realm there’s an expectation that it’s being bought and sold,’ he says. The e-book therefore, has more potential to yield an income. In parallel with traditional publishing, entrepreneurial writers are advised to establish mini-marketing departments. They must self-promote, advertise and build themselves ‘a platform’ on social media. But O’Brien cautions against the rhetoric, ‘A lot of writers are working on the assumption that if they can build up a critical mass of followers on Twitter or Facebook (or wherever) they can translate that into sales [of self-published work],’ he says. But the problem with this assumption is that although we can measure the number of followers we have, we can’t measure how much these followers care. (Some people follow on a whim - thus their true interest is negligible – and who knows how often your followers read their social media). ‘I’ve seen people who have thousands of Twitter followers promoting their work and finding it really, really hard to sell a handful of copies,’ says O’Brien. He believes the main way self-published writers get recognition (and sales) is via the endorsement of an established writer. ‘It’s the same in film and music. Independent musicians get the ball rolling when they are promoted by an incredibly well known musician,’ he says. Some writers try to reach new readers through paid advertising (such as Google Adwords, Goodreads or Facebook). But as O’Brien notes, ‘When you’re a writer, you’re trying to do something that’s nuanced. You’re not trying to do something derivative. It’s hard to get that across quickly.’ (Note: I’ll be publishing O’Brien’s tips on Facebook advertising in a future post). At Tomely books are often sold in bundles (curated groupings that include work from both established and emerging writers). These are the best way for Tomely to sell the work of new writers says, O’Brien ‘The one or two authors that are well known are pulling up the other authors.’ It’s a model that echoes traditional publishing – both the editorial package, and the mix of trusted and new work. This post was originally published 6 August 2013. On one level, Facebook is a social situation (a virtual place where writers can combat some of the isolation our environments bring). There we can chat, network, share ideas, research and find inspiration. But Facebook is also a business tool. It has potential to deliver us to new readers and (in the case of self-published writers) to generate sales. Navigating Facebook offerings requires some deft though – both in terms of free (‘organic’) opportunities and paid ads. Successfully advertising via Facebook is all in the pitch says Connor Tomas O'Brien. Thanks to Big West Conference for use of this image BASEBALL Pitcher of the Week - April 12-18, 2010 under Creative Commons. ‘If a stranger pitches something to you on a Facebook ad it’s going to be viewed as spam (unless it’s immediately obvious that it’s something you will be interested in),’ says Connor Tomas O’Brien (writer and co-founder of Tomely, a DRM free e-bookstore). He’s used paid ads to promote Tomely’s work with some success. ‘It works fairly well, but when people are talking about us organically it works a hundred times better,’ he says. Consider the reaction to your organic posts before spending on a paid ad. ‘If an author can’t get an organic buzz around what they’re doing a paid ad isn't going to help at all,’ says O’Brien. An ad needs to be engaging to get picked up. ‘If you can’t get anyone to pick it up just by telling them, then throwing it in their face and paying for that still won’t help,’ he says. And as I learned, if you don’t set up your Facebook presence properly you won’t be able to maximise organic posts. There’s a difference between signing up to Facebook and setting up a Facebook page. Choosing the wrong one can have implications. * A page is simply a presence on Facebook that those who’ve signed up to Facebook can ‘like’. It enables you (as the page owner) to write posts, but doesn’t allow you to engage with others unless they’ve specifically engaged with you. A page is more like a platform for very limited narrowcasting. Signing up enables you to actively participate in the discussion. In signing up you are essentially creating a personal Facebook page (which you can make into your writing-promotion page by putting all privacy settings to public). Unlike when you have a page, you can post to others’ walls, comment and engage. If you like your privacy, you might be inclined to set up a page rather than sign up. However there’s a crucial difference between the two: when you have a page, and you post to it, Facebook doesn’t deliver all of your posts to all of the users who’ve liked your page. In order for that to happen, you have to pay money. The only way for cash-strapped writers to maximise organic posts on Facebook is to sign up. Facebook’s odd mix of social situation and big corporation makes its a tricky forum to promote the work of writers. But you can get some benefits – and even use its ambiguity in your favour. Paid Facebook posts are displayed both in the timeline and the sidebar. ‘It’s the ones that are interspersed in the timeline that are more popular,’ says O’Brien noting the blurring lines between advertising and editorial. *Once you’ve set up a page in your name it’s possible to change it to a personal account - but there is a drawback. By getting Facebook to change the type of user you are you’re very likely to lose your ‘likers’ (the page equivalent to ‘friends’). Buoyed by the early days of aggregators (like Longreads and Longform) as well as digital first publishers like (Kindle Singles, The Atavist and Byliner) I self published my long form essay After Shock on Amazon in 2012. I’ve written previously about this process, my reasons for doing it, my ‘success’ and some things I wish knew about self-publishing before I started. This is the second post about things I wish I knew, with a particular focus on being an Australian writer. In the 18 months that have passed since I first published I’ve come to believe that while Amazon may be a worthy self-publishing outlet for US citizens, it’s not necessarily a good deal for Australian writers (particularly those who are publishing essay-length pieces that have limited price points and those who aren’t big names). Of course there will always be exceptions but I imagine my experience will parallel with many others. If you’re not instantly switched on by what I’m writing (but are thinking of publishing to Amazon), please do keep reading. It’s that lack of interest that got me in the pickle I’m in now. This post aims to help you avoid it. If you do the maths, Australians publishing via Amazon doesn't always add up. 1. When you sell to Australian-based buyers you only get 35% royalties – no matter what price you set. 2. There’s tax paperwork to be done otherwise you’ll have to pay 30% of your royalty income in US taxes. Australia and the US have a tax treaty, which means that (with the right paperwork) Australians can pay 5% US tax rather than 30% (the default for foreign entities). Depending on how you approach it, completing this paperwork can be time consuming. In the past it has required documents being delivered (in person or via mail) to your local US Consulate. These days that may not be necessary (check out this post by Catherine Ryan Howard describing an alternative). But it still takes some preparation and an overseas phone call. Once you’ve established your tax status with the US Internal Revenue Service (IRS), you have to inform Amazon of this. In the past this involved a paper form (marked only with a blue pen) which was posted via snail mail. Recently Amazon has set up an online system (Howard’s blog and its many comments also describes how to do this). If you’re anything like me, you will be tempted to put this whole tax palaver on hold. Don’t. My understanding is the rate can’t be backdated. It applies from the day you set up your Individual Tax Identification Number (ITIN) or Employer Identification Number (EIN) – or at a stretch the same financial year. The US IRS told me that if I wanted the 5% tax rate to be applied to my previous sales I’d have put in a tax return for each financial year. Yes, I’d have to do more confounded paperwork. Hardly worth it given the number of sales I’ve had. All of my sales have been a result of my own marketing efforts. Because I didn’t set up my tax status before I made these sales, my efforts have essentially been financially reduced by 25% (that is, unless I wanted to take even more time to try to get that 30% tax rate reduced to 5% via tax returns). We’re talking about less than 100 sales, most on a 35% royalty rate on the princely price of either USD$0.99, $1.99 or $2.99. (I have different prices because I was experimenting with them). If you're an Australian writer, don’t start selling via Amazon until your tax status is set up with the US IRS. 3. It’s complicated for Australians to tap into the Electronic Fund Transfer (EFT) payments which most likely means you have to accrue at least USD$100 in royalties (for amazon.com) before you get paid anything (by cheque). Australians can’t set up an EFT account with Amazon* using their existing Australian bank accounts. Because of this we theoretically have to wait until we accrue enough royalties to meet the cheque-raising threshold. For sales on Amazon.com that’s USD$100. There are different thresholds for each Amazon market (eg amazon.co.uk, .co.jp etc.) the thresholds aren’t combined. So to put this simply, if you have USD$98 in royalties via Amazon.com and GBP£10 via amazon.co.uk, you will not yet be paid anything in either market (even though combined they add up to exceed USD$100 threshold). Your sales have to exceed the threshold in each market you sell to. That’s a lot of sales in the context of independent long form non-fiction. I was trying to find new markets so I sold to all English-speaking markets as well as to Japan. I shouldn’t have. If you must sell on Amazon, restrict your markets to just one. 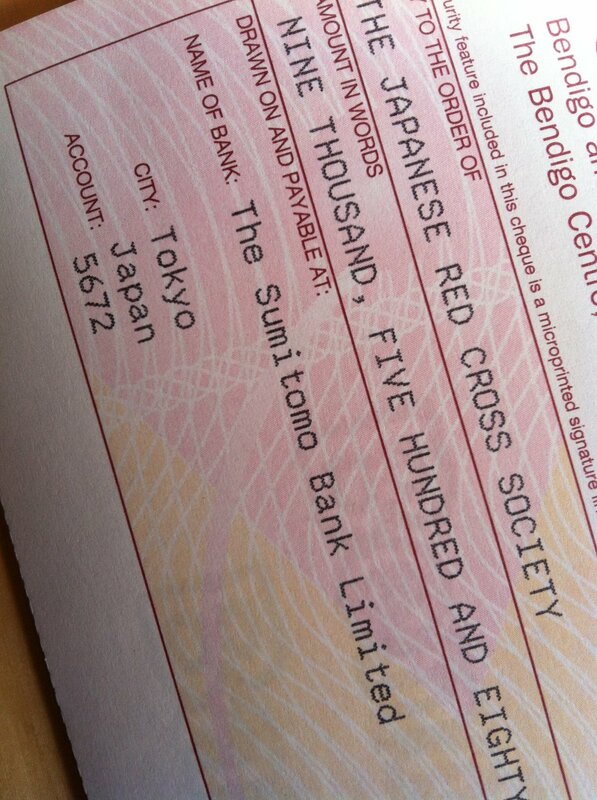 But before you do, ask yourself how likely it is that you’ll exceed the cheque-raising threshold. I knew I wasn’t likely to make more than USD$100 but I didn’t grasp what that meant. The EFT threshold is a much more accessible USD$10 in royalties. But because of the EFT restrictions* it’s more complicated and costly for an Australian writer to tap into that. Unless you’re a big name, or your piece takes off in the zeitgeist it will probably be hard to generate enough sales to reach the threshold. Australians may wait years before accruing the cheque-threshold of USD$100 to get paid. On the up side we can get paid if we pull out of the program (ie close our accounts with Amazon). *5. Yes there are workarounds for points 3 & 4, but if you’ve earned less than $100 in royalties you’ll probably find the fees associated with the workarounds simply aren’t worth it. Some Australian writers are using payoneer.com combined with a Mastercard to get their payments (Amazon doesn’t yet pay to Paypal). On the surface this seems like a viable option, but if you consider the (not unreasonable) fees associated with Payoneer it’s probably not viable for Australian writers selling individual long form pieces. A writer might have $50 in royalties owing. But it costs around $30 annually (plus the extra time involved) to set up an account with Payoneer into which your royalties could be paid. 6. Statistically speaking Amazon is unlikely to bring you new readers. I signed on with Amazon because I knew it would be easy and I knew they had the widest market. My naive hope was that they would introduce my work to new readers. But as stated earlier, every sale I’ve made can be linked to my own marketing efforts. Amazon really is a jungle, and it’s hard to get heard. 7. If you do the maths, Australians publishing to Amazon doesn’t always add up. Let’s set up a scenario, loosely based on my own experience. The highest price at which I sold my article was USD$2.99, the vast majority to Australians. My royalty was 35% ($1.05, but let’s round everything to make this simpler: $1.00). I would have to sell over 100 copies in a single market to get paid via cheque. (And selling this number of copies is much easier said than done, as described in my post Goodwill Hunting). I then need to consider the tax situation. Because I put off getting my tax status set up, Amazon/US IRS will take away 30% of my royalties in taxes (a further 30 cents per sale to date). That would leave me with about 70 cents for each copy sold. Knowing that I’m unlikely to double my royalties (ever) and may never get a cheque, I might consider the EFT workaround via Payoneer. That costs USD$29.95 per year. What say I sell 43 copies – so there’s around $30 coming to me from Amazon after tax. Take out the $29.95 for the Payoneer service and I’ll get about 5 cents. Five cents. For all that effort. I wish I’d understood that before I started. At least you do now. It’s time for our annual orbit around the future of long form. In last year’s post, The Future of Long Form: An Odyssey we visited seven virtual space stations in the new media galaxy. This year we’ll fly past each one in a rocket travelling at 475 kilometres a minute. We’re cleared for launch and counting down; five, four, three, two…. If you look through the porthole to the right of the rocket you’ll see this, the oldest station in the long form galaxy – coming out of the Guttenberg inspired revolution: publishing your words in print. The view from a rocket. Thanks to NASA for use of this image. Despite its so-called retro look, I still love to see my byline printed at this station. In fact, I think I have more faith in traditional print than I did before I started using my e-reader. (I don’t like e-reading as much as print-reading). Yet, despite my enthusiasm, the print world continues to be challenged by the disruption new media has brought. I’m not aware of any newcoming Australian or international print-based publications of long form (please enlighten me if you know of any). However, I am aware of print publications moving to entirely digital delivery. This station is surrounded by a constellation of newly documented stars marking the increase in opportunities to pitch your long form work to online publications. This year saw the introduction of high-profile sites The Big Round Table (US) and Matter (UK). Both were seeded by crowd sourcing campaigns and both are using paywalls (Matter has since sold to Medium). The Big Round Table is donation based (which means that you may not be paid if you are published or you may be paid a lot). Matter uses a subscription/pay-per-read model. There are also opportunities to submit your long form work for e-publishing by some of the leading publishing houses. (Certainly before their merger both Penguin and Random House were keen on more long form, no doubt Penguin Random House will be too). Slightly behind the rocket here you may catch a few falling stars. These are the international and local initiatives that provided platforms to crowd fund articles. Our local version youcommnews.com has disappeared offline altogether (perhaps one day it will reappear) and the US version Spot.us might sadly be fading (at time of publishing, the most recent funding requests date back to 2012). Some journalists (not just writers) have succeeded in using generic crowd sourcing sites to fund their stories (like pozible.com, kickstarter.com and indiegogo.com). However this model is yet to be proven for long form writing. While the community funded reporting model may be dimming, there is a little sparkle when it comes to crowd sourcing long form publishing houses. Both The Big Round Table and Matter were seeded in this way. Thanks to the generosity of Wotif founder Graeme Wood, Australia still has The Global Mail (funded by a grant from Wood) and now our own masthead of the UK’s Guardian (an investment rather than a donation). In the past 12 months Wood has also donated $1.5 million to the International Consortium of Investigative Journalists. He’s certainly committed to the idea of ‘Philanthrojournalism’. There are initiatives such as Write for Life that are compiling articles into books which are then sold to raise funds for charity. It’s a nice idea but no doubt suffers from the same challenges all small publishing does – namely finding enough readers. Incidentally, in the past year I’ve tried to raise funds by selling my long form article online. I got a lot of exposure, but didn’t raise a lot money. You can read all about that in my post Goodwill Hunting. As always, if you don’t want or need to get paid for your work, you can publish your long form article on your own site or blog. Be aware however (to reformat the old adage) if you publish it, they may not necessarily come. Readers can be as elusive as those stars you only see from the corner of your eye. It’s vast – but despite this, station seven is the most crowded in our orbit. Literary-astronauts are lured by the ease of access and the promise of 70% royalties. But setting a long form piece into the new media galaxy alone is not enough. It has to be heavily marketed, and even then may not find readers. Most of the work published from this station just drifts aimlessly into space. That’s our 2013 rocket trip on the future of long form in the new media galaxy concluded! I’ll be most interested to see what the journey will show in another year’s time. Keep checking the Venues and Resources page of this blog to learn of new publishing opportunities. * If you’re interested in a good overview of journalism funded by philanthropy read this recent post by Matthew Knott on Crikey. It's good to put ourselves in our editors' shoes every now and again. 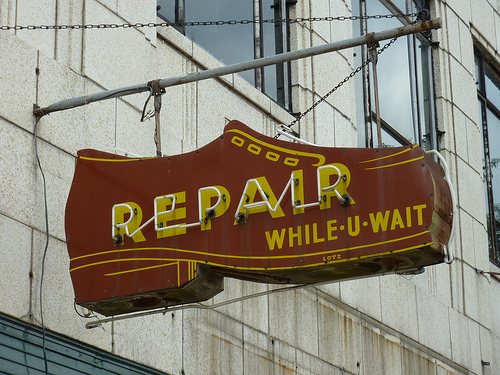 Thanks to sfgamchick for use of this image, Shoe Repair Sign, under Creative Commons. I’m heartened when she tells me this. But I still wonder, are there things we commonly do that can make life difficult for an editor like Case? She says that writers don’t commonly make the same mistakes, but there are a few things we could avoid – things might that set an editor’s feet tapping impatiently. Another difficulty for editors is when writers fail to meet the agreed word count. ‘Sometimes writers think if they go a bit over it doesn’t matter so much because the editor can just cut it out. But you can’t just lop off the end of an article. You need to find the spot to cut it,’ says Case. This again, can take some time. Stick to the word count – particularly if writing for print. After receiving a submission, the first thing that Case assesses is how a piece flows and whether it works as a whole. She says she most frequently adds more punctuation to improve the rhythm (things like dashes, semicolons and commas). ‘I’m just punctuating it as you would speak it,’ she says. Before submitting, always read your work aloud. In ensuring the coherent argument of a piece, Case finds herself tinkering with introductions and conclusions the most. Sometimes the piece doesn’t flow because writers fail to include something important or obvious. ‘Because you know it in your head you might forget that you haven’t written something in, or that you took it out,’ says Case. Ask yourself what the reader needs to know. ‘If there are complex ideas in there, make sure that they are explained,’ she says. A challenge to being an aspiring writer in the new media galaxy is in building a platform. These three words refer to being active in social media rather than writing well, generating good ideas, being approachable or reliable. As much as I love the tweets and enjoy Facebook, the words build a platform always evoke swirls of frustration in me. They rest on the notion that a writer active on social media will soon yield a huge virtual platform. A place from which to spruik their message to hordes of eager readers/buyers. Mmmm. I’ve thought this notion dubious for some time. Not only do I have a sense that social media platforms are becoming saturated, but also I have pondered the limits of social media as a ‘platform’ for emerging writers. Many say it’s an asset to establishing a writing career but I’m not yet convinced. Two weeks ago, in a post about my fundraiser I demonstrated the limits I found (and these were despite assistance from influential Tweeters). My old boss, Tim O’Neill, Joint Managing Director of digital agency Reactive and AIMIA National President was an early adopter to Twitter. When he recently noted its limitations he had me listening. Reckon we can all fit up there and still be heard on the information superhighway? I'm not so sure. Thanks to caribb for use of this image 12 Birds under Creative Commons. 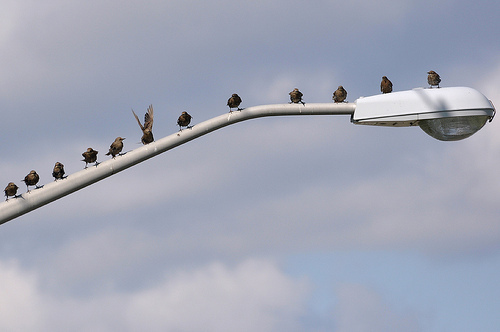 ‘In the earlier days (maybe two years ago when everyone was new to Twitter) everyone was out to find new followers. Everyone would follow people quite easily,’ O’Neill says. Back then a person could be strategic about generating followers. They could devise logical strategies to draw them in. ‘It would be quite achievable to get ten or twenty or thirty followers in a day just because people would sign up quickly,’ says O’Neill. But now? Not so much. These days most people think they have enough followees in their feed. ‘I’m personally really reluctant to follow anyone,’ says O’Neill, describing himself as somewhat mercenary. ‘It’s nothing personal. If I see lots of tweets from someone that are not relevant to me, then I’ll just unfollow – so that my tweet stream is interesting to me all the time,’ he says. Most of O’Neill’s 1,800+ followers were obtained in his first year on Twitter, the rest have just dripped in, on by one. It used to be different. ‘The classic way to manufacture more followers is to get someone who’s really popular on Twitter to retweet (or to mention you),’ says O’Neill. In the early days this would yield followers who presumed that you had something in common with the retweeter. (The hashtag #FF ‘Follow Friday’ is a part of this culture). ‘You’d get 100 followers straight away but now you don’t. You get maybe two or three,’ says O’Neill. ‘Part of [this challenge] is how Twitter handles retweets now,’ he explains. ‘Before Twitter had its inbuilt retweet function you used to have to do an RT (a manual retweet) and a manual retweet has a higher visibility of the person who’s retweeting,’ he explains. This would alert potential followers that the retweetee had the same interests as the retweeter. O’Neill notes that the more-recent inbuilt retweet function maligns the name of the retweeter to tiny font, and renders their endorsement far less influential. If you want to draw attention to someone’s Twitter presence you would be better to include their @ handle in the body of the tweet, says O’Neill. More than that, tell the reader what’s in it for them. ‘It needs to be a simple and clear message and be obvious what it’s for or what it will do,’ he says. I’ve interviewed a few publishers over the past year, and while they are all adamant that good writing is central to getting published, they also admit that a social media ‘platform’ can help. From an independent publisher’s perspective a bigger platform can simply save them time (in the same way that a flawless manuscript can). The more you can contribute from a marketing (and editing) perspective, the more attractive you are to them. A larger publisher stated clearly that many writers don’t get involved in social media. However she noted that the authors who do make an effort via social media can be more successful in getting reviews and attention. So I suppose we all have to persist. Looking from a tall city window I see the uniform shape of panes in the building opposite. Each gives me a little scene (of desks, chairs, shelving and cabinets) in a cookie-cutter tableau. I see a world of difference between these offices and my humble desk at home. It’s a distance from ‘business’ that is typical of writers. I even nurture it: I vary my hours daily, I don’t have a filing cabinet and some days I start work in my pajamas. But there’s one thing about business from which distance is non-negotiable and that is understanding contracts – particularly for writers who want to be paid. Shrinking newsrooms, merging publishing houses and the proliferation of free content all sit on the not-so-great side of the income-earning ledger. On the other hand new initiatives like digital-first or digital-only publishing houses and print-on-demand technology have been encouraging. For some writers there may be potential income in exploring in these new spaces but Alex Adsett, Consultant and Literary Agent with Alex Adsett Publishing Services, says we should check the fine print. You may be contracted for life if you don't take care! Thanks to Michael Cory for use of this image Empty Office under Creative Commons. ‘Writers should be aware that a lot of digital-first or digital-only contracts still try to get everything,’ she says. By ‘everything’ Adsett is referring to rights (such as film rights, translation rights, audio, merchandise, serialisations, the right to on-license, print rights and more). ‘If [the publisher is] going to do something with them then that’s fine and that’s always a decision the author needs to make... But if they’re just some little company that just wants to sell your e-book then they shouldn’t be getting that broad a range of rights,’ says Adsett. Limit rights where appropriate (for example with a digital-only company writers should try to license only digital). Keep in mind what’s appropriate. (Writers often take care with regional rights, but in a digital setting world-rights might be needed given the costs of geolocating / blocking and the small profit margins involved in publishing). Those of us excited by the opportunities new technologies bring need to understand the affect of these on the old ‘out-of-print’ clause. Traditionally this clause reverted rights back to the author when a work was no longer in stock. ‘With e-books and with print-on-demand technology, that’s just not realistic anymore. A book is always going to be available for sale,’ says Adsett. She warns that the out-of-print clause applied to digital or print-on-demand technologies could mean a publisher holding rights to your work in perpetuity (even if they have no intention of making that work available). Adsett says that good publishers are applying new ‘reversion’ clauses to cover out-of-print in both e-book and print contracts. In these contracts out-of-print is defined as either relating to a sales limit (for example, if less than 50 or 100 copies are sold in a 12 month period) or it’s defined as relating to an expiry date (in the form of a fixed-term contract). The dwindling sales or the expiry date trigger a reversion of rights back to the writer. On self-publishing platforms Adsett says we should check for similar ‘escape’ clauses. She warns that publishers refusing to negotiate fairly on rights may be a part of a new numbers-oriented breed that has emerged alongside new technologies. ‘There was always a high cost to publishing. You had to actually believe in a book to put your money into the printing of it,’ says Adsett. Because of this, traditional publishers invested in editorial, design and marketing. They contributed their expertise and hard work and in doing so they gave writers a stamp of quality. By contrast, new technologies have reduced the cost of publishing significantly. Some new publishers are adopting a more hardnosed model. They sign up hundreds of pieces and invest in little or no editorial. In this scenario if one in 100 pieces sell through, the numbers add up and the publishing business (and one writer) is successful. But it’s a poor deal for most writers says Adsett, ‘All of the other 99 authors have signed away their rights for almost nothing, for almost no sales, and not a lot of chance of getting their rights back.’ If you send your work into that cookie-cutter framework you’re likely to be worse off. You may even find yourself sitting, in a suit, at a desk, from 9 to 5 in one of those tall office buildings making back the income you lost. Contracts may be complex, but our contractual obligation is simple. ‘Even through all that excitement of [getting a publishing offer] think about what you’re actually signing and why,’ says Adsett. When I was in Japan earlier this year I tried to interview a local friend of mine. I’d hoped to capture her story on audio for later use in some kind of podcast or radio documentary. She’d already spoken about her experience in English (her second language) with great depth and lucidity. When I asked her if I could record an interview she was pleased. And then she said, ‘Would it be OK if you gave me the questions first, so that I can write the answers and read them to you?’ She wasn’t prepared to go on the record without perfect English, yet I wasn’t interested in a perfect answer. It was an awkward situation both practically and culturally. As I pursued that ill-fated international story I frequently found myself in quagmires of cultural difference. I came to the conclusion that I’d best improve my processes before I visit the country again. At NonfictioNow this Saturday, four writers (Benjamin Law, Desmond Barry, Mieke Eerkens and Stephanie Elizondo Griest with David Carlin) will front a session, International Research and the Nonfiction Writer. They’ll provide us with practical information and encouragement on writing and researching in lands far away. Australian writer, Benjamin Law (The Family Law, Gaysia) is fast becoming an expert on researching and writing overseas. For his most recent book, Gaysia he traveled to seven different countries over 18 months, ‘I got used to writing the book in windowless hostel rooms in Malaysia, overnight train compartments in India and airports,’ he says. But frustration and inspiration often come hand-in-hand. ‘That sort of stuff was hilarious too, and I can remember laughing like a madman throughout it all, thinking it'd make for great material,’ says Law. (Indeed, in writing this post, I’ve just rehashed my own frustration in my first paragraph). Those of us who are interested in international stories are also interested in being overseas. ‘Going to a country I've never been to before makes me feel 10-years-old over again. Everything is interesting and new and stimulating, and the people you meet are constantly surprising. It's enough to give you a nosebleed,’ Law says. In a bid to ensure he understands the fundamentals before leaving home, Law reads up a lot. He organises a quota interviews including one close to his arrival, ‘with someone who could give me the lay of the land… [and] more stories and leads to follow,’ he says. When he knows he’s traveling a lot he buys a year of travel insurance. Writing and researching overseas ‘is sort of humbling too… it was a good reminder that writers are supremely lucky… All I needed was my laptop, my notepad, pens, backpack, good plumbing and a lockable room every night,’ says Law. This session could be a corker for anyone planning or writing stories away from home. (Speaking with Law has alone buoyed my plans for another Japanese story). Benjamin Law will be presenting in the session International Research and the Nonfiction Writer with Desmond Barry, Mieke Eerkens and Stephanie Elizondo Griest and David Carlin on Saturday 24 November at 10.00am. Visit the NonfictioNow website for more detail. Yes, but did you ask? ‘One of the primary joys of being a writer comes from the people you meet and the situations you get in.’ Sarah Marshal, Portland Review (April 2012). Getting into these situations takes a little chutzpah. Personally I’m an advocate of the ‘don’t ask, don’t get’ philosophy. If I’m really interested in a topic or a person I will ask for interviews. I wouldn’t say that I was ‘ballsy’ but I don’t see the benefit of staying mute. The goal of this line was to draw on the idea that there was a public Toby Young and a private one (or that’s what I told myself). But David saw that it revealed something else: I wasn’t prepared to ask the difficult question. ‘It’s a really common fault in emerging writers,’ says Margaret Simons, award-winning journalist, Director of the Centre for Advanced Journalism and coordinator of Masters in Journalism at the University of Melbourne. She’s referring to, ‘an unwillingness to do the difficult interview’ – a trade skill that has traditionally been taught in the newsroom. Toby Young's book (also made into a movie) is about a writer who asks difficult questions. You may think you can fudge over your lack of questioning. But Simons says it's evident in your work. In its simplest form it shows in a bias (because you’ve interviewed people from only one side of the debate). More subtly it can be evident in the quotes (or lack of) from your main interviewee - like my first-year profile on Toby Young. (I didn’t want to push it. After all, Young is a hero of mine). I like to think of myself as media savvy. I watch our local program, the ABC’s Media Watch. I think I can recognise bias in work. But I take heed in the fact that I am outside a newsroom of any description, working alone and very much within my own head. Though I like to see myself as objective I know I must take care. In the new media galaxy writers must be certain that we’ve asked the difficult questions. If you’re in Melbourne (or will be in late August) checkout the schedule for the New News conference at this year’s Melbourne Writers Festival. ‘What cost news’ ($19.50/$21.50) and the discussion afterwards ‘New News: Future of Journalism’ (free). Also, Alan Missen’s Keynote ‘Oration Literature and Global Citizenship’ ($27/$30). Writers’ lore states that though writing for publication is a challenge, the bigger challenge is in promoting your published work: getting sales and readers. Without the support or contacts of a big publishing house, promoting your work as a self-published writer surely has to be harder. I imagine self-published writers as lone hitchhikers, holding their thumbs up along the shoulder of the information superhighway, trying to get noticed. They say that social networks of the digital kind are crucial to getting picked up. Yet apart from ‘Don’t spam,’ solid tips on promoting your work this way are absent. I confess that Twitter – and how to approach it – puzzled me for quite a while. But I think I get it now: Twitter is just one big party. Thus, when promoting your work on twitter, party etiquette applies. Are you still awake?! Apart from its dearth of worthwhile prose this tweet failed because it was addressed only to friends who knew what, ‘my experience in Japan’ actually meant. I didn’t specify the topic of the essay. Had anyone retweeted it (they didn’t) it would have been meaningless to others. It was the same as going to a party and only hanging out with people I knew. Tweets promoting your work must be able to be understood and accessible by complete strangers. Hah! ‘Please RT’ (retweet) I’m not surprised that only four friends did. Tweets promoting your work are as important as your article’s opening line. Make those tweets take potential readers right into what you are writing about. Take it as seriously as your lead. Had I been at a party, I’m not sure I would have walked up to Ambassador Roos and said ‘Oh Hai! Can you promote my essay? Thanks! Please be good to me!’ and then walked away. I would introduce myself. I would take the time to learn a bit about him. I might comment on things we had in common. And once I develop that rapport I would mention my essay and ask Ambassador Roos what suggestions he had on how I could promote it. Before you send a tweet to a stranger make sure you’re approaching them the way you would in person. Don’t barrel right in. Start a dialogue. See what strangers are tweeting about and join their conversation. Find people who are asking questions and answer them (or refer them to another twitterer/writer/subject matter expert who can [including @ handles]). This is a great way to meet interesting people whom you might never have met otherwise! Introduce people who have something in common, and when you hear people talking about something you are interested in, join the conversation. It's one thing to follow sources for news, information and entertainment. But just like at a party, there are occasionally people who monopolise the conversation. I have a few people that I follow who follow me back. This reciprocal arrangement can be nice. But beware of being a followee among hundreds (or thousands). Conversely, be thoughtful about who and how you follow others. Don’t ask your followers to retweet then not return the favour. Don’t expect them to read your tweets while blissfully ignoring theirs. Avoid bores and don’t become one: read tweets, respond to tweets - engage with your followers and those you follow. So, remember to twitiquette as to etiquette.